For more information visit http://www.reanolanmartin.com and follow the Rea on Twitter and Facebook. 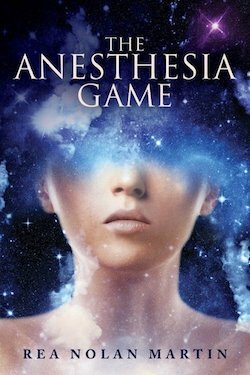 The story behind The Anesthesia Game is very close to my heart. The fifteen-year-old protagonist, Sydney, suffers a life-threatening illness that requires frequent spinal procedures for which she undergoes regular anesthesia. Having spent years accompanying my own child through such procedures, I understood from page one the spectrum of courage (or cowardice) my characters would likely exhibit, patient and family members alike. Having said that, this story is far from a memoir. The personalities of my characters vary greatly from those of my own family. I constructed the characters from scratch, asking myself—what if not one, but all of them suffered some kind of affliction, real or imagined? What if, in order to manage their afflictions, each one of them was also under the influence of her own version of anesthesia? How would they manage to help each other? How would they progress? Or would they? Who would lose a life and who would find one? After the first 100 pages or so, the characters showed me the way. As a writer of Literary and Visionary Fiction, I imagined the child’s disease and the resulting anesthesia, not as a means of sedating her life, so much as awakening it. After all, what value do negative experiences contain if not to hone us and/or those around us? The problem is, at what price the experience? The risks in this story are as high as they can be. Lives hang in the balance. Circumstances surrounding childhood cancers are tragic from anyone’s perspective, but much is to be gained if we have the courage to tread consciously through such toxic waters. The patient is of course the central concern, but the peripheral damage to family and friends can also be acute and widespread. If they’re paying attention, almost everyone involved ends up learning something powerful about him or herself in the process. Coincidentally, the essential component of Visionary Fiction is the awakening of the deep self to greater purpose. I first learned about Visionary Fiction (VF) when my previous novel, Mystic Tea, was awarded several literary prizes in that genre. Exploring it on Google, I discovered the VFA (Visionary Fiction Alliance) with a mention of my name as one of its mainstream authors. By their definition, VF, it turns out, is the oldest new genre there is. Myth is VF; fairy tales are VF; even ancient sacred texts contain all the consciousness awakening components of this powerful genre. I wrote Visionary Fiction decades before I knew what it was, as has been the case with most contemporary authors in that sector. It was simply the truth as we knew it. VF authors tend to be highly intuitive and imaginative believers in infinite possibility. Unlike other genres, its literary DNA emerges not from the demands of plot or even the growth of its characters, but from the authenticity of the writing as an expression of the soul. In writing The Anesthesia Game, I did my best to honor that tradition. 40-something Hannah, 50-something Mitsy, and 60-something Pandora indulge in a creative assortment of addictions that obscure the mysterious connection to a common past that haunts them all. Estate reserve pinot noir, QVC, and a deck of maxed-out credit cards drive Hannah and her Virginia horse farm into a financial corner. Religion, spiritualism, and an addiction to the telephone mystic, Pandora, create the agoraphobic cave into which Mitsy retreats from everyone, including her critically ill 15-year-old daughter, Sydney. Pandora trades her green tea and tofu for the cigarettes, coffee, snickers, fine wine, and hashish that muddy her mystical vision just when she needs it most. The link to their recovery is Sydney, the child among them, and the stake they all share in her perilous condition and unlikely cure. As Syd submits to weekly treatments for an illness she refuses to grace with a name, she plays The Anesthesia Game, a game that ultimately leads her to the origin of her disease and a possible way out of the struggle that binds them all.